Premium Compatible Label Tapes for the Brother P-Touch E550WVP printer. Brother P-Touch E550WVP is a resourceful handheld label printer that prints long-lasting labels needed by Datacom, electricians, security and telecom equipment installers. This compact label printing machine is also designed to offer the versatility of designing and printing labels from a smartphone or tablet besides a computer. It produces excellent quality labels through built-in labelling functions provided especially when coupled with Brother P-Touch E550WVP Label Tapes. Brother P-Touch E550WVP can also be connected to a database in order to send label designs and databases wirelessly by email or with the help of a cloud server. It is also acknowledged for speed (30mm per second), fulfills the UL-969 standards and conforms to ANSI/EIA/TIA-606A/B parameters. It features a QWERTY style keyboard and function keys that enhance its utility. The machine prints superior quality labels that don’t fade especially when printed with Brother P-Touch E550WVP Label Tapes. Other attributes of the Brother P-Touch E550WVP machine automatic cutter and a large backlit display to facilitate printing broader labels. It is able to handle a tape width of up to 36mm and print a maximum height of 18mm. In order to optimise its utility, choosing components like Brother P-Touch E550WVP Label Tapes that suit it thoroughly plays a key role. 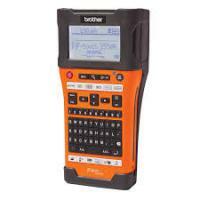 The Brother P-Touch E550WVP handheld industrial label printer is perfect for Datacom, electricians, security and telecom equipment installers. Besides, PC, it prints efficiently from smartphones and other devices.comes with adequate features that make it ideal for office as well as home. However, Brother P-Touch E550WVP it’s a bit on the heavier side, which makes holding it challenging. Q. What are the key features of Brother P-Touch E550WVP printer? Q. How do I change the character size? Press the Style key. The current settings will get displayed. Until the ‘Size’ is displayed, press the Up or Down arrow key. Until the desired character size is displayed, press the Left or Right arrow key. Press the OK or Enter key to apply the settings. New settings are NOT applied if you do not press the OK or Enter key. Q. What is Wireless Direct? A. Wireless Direct allows you to configure a secured wireless network without using an access point between your printer and a mobile device or a computer. Q. The Brother P-Touch E550WVP Label Tape color is not recognised. I get the error message ‘Tape color not recognized’ when I install a tape cassette in the printer. What should I do? A. It usually happens when some tape cassettes are unable to identify their tape color. If so, white color tape is displayed on the editing screen of P-touch Editor, instead of the actual Brother P-Touch E550WVP Label Tape color. Printing will not be otherwise affected. Q. How do I print multiple lines and how many lines can I print? Type the first line of text. Press the Enter key. A return mark appears at the end of the line and the cursor moves to the start of the new line. Type the next line of text. Repeat the steps 2 and 3 until all lines are entered. Then, press the Print key to start printing. Q. The Brother P-Touch E550WVP Label Tape does not cut well. How to resolve this issue? Q. Can I use text as the Brother P-Touch E550WVP Label Tape background for the Background Printing function? Start up P-touch Editor, open the edit screen and click ‘Format’. Then, click ‘Background’. Click ‘Text’ and select the text box. Enter the text and choose the pattern you want to display on the background, then click ‘OK’. Q. Why doesn't my machine turn on when On or Off key is pressed? A. When the machine doesn’t turn on even when the On or Off key is pressed, make sure that the batteries are inserted with their positive and negative poles pointing in the correct direction. If the batteries is running low, the power does not turn on. Replace the batteries with six new AA batteries. If rechargeable batteries are installed, recharge all batteries. Make sure that the AC adapter designed for this machine is used.